In this post, part-time OHMA student Bud Kliment examines the relationship of folk music to oral history through the intersecting careers of Alessandro Portelli and Barbara Dane, occasioned by the release of Dane’s retrospective Hot Jazz, Cool Blues and Hard-Hitting Songs on Smithsonian Folkways. Like other forms of oral history, folk music and traditional song styles require their performers to negotiate the past for listeners in the present. In his writings, Alessandro Portelli refers often to the time when he collected and compiled Italian folk songs and other music for the Istituto Ernesto de Martino sound archive. By the 1960s, portable tape recorders had transformed fieldwork, allowing, in his words, “music, oral history and other forms of expression” to be captured all at once and considered together. Recording had also liberated the products of fieldwork: instead of publication, Portelli’s work with Rome’s homeless population was issued in 1970 as a record album, Roma, la borgata e la lotta per la casa (The Slums of Rome and the Squatters’ Movement). Anticipating the podcast, the disc is a mixture of “songs, sounds and sayings,” including the Mayor of Rome, a folk tune that became a minor hit, and the noise of policemen evicting squatters, captured by a microphone hidden in Portelli’s overcoat. He later recalled that he “put this material together...in my kitchen, with two erratic Uher machines, scissors, and slicing tape.”. All the voices on the record are stirring, but Barbara Dane has the central role; she’s a full-throated singer with a commanding presence. According to Portelli, she said, “We have to sing as if we were at a demonstration, these are fight songs." To celebrate and commemorate Dane’s place in American music, Smithsonian Folkways has just released a double-disc retrospective of her career, Hot Jazz, Cool Blues & Hard-Hitting Songs. Compiled with Dane’s help (at 90 she is still performing), the set’s title and contents accurately describe how she traversed musical styles. It includes her bluesy “Trouble in Mind,” the acerbic folk-pop of “It Isn’t Nice,” and her rendition of “Millworker,” a quiet, devastating James Taylor song from the musical version of Working by Studs Terkel. A white woman with a big voice, Dane sang with Lightnin’ Hopkins, Louis Armstrong, the Chambers Brothers and others, offering persuasive evidence of what kind of partnerships and exchanges were possible in American society as well as its music. Yet Dane will always be most associated with folk and protest music. During years when many folksingers doubled as activists, she was exceptional, relentlessly daring. With Irwin Silber, her third husband, she helped organize a pair of “Sing-In For Peace” concerts at Carnegie Hall in 1965, an early effort decrying American involvement in Vietnam. 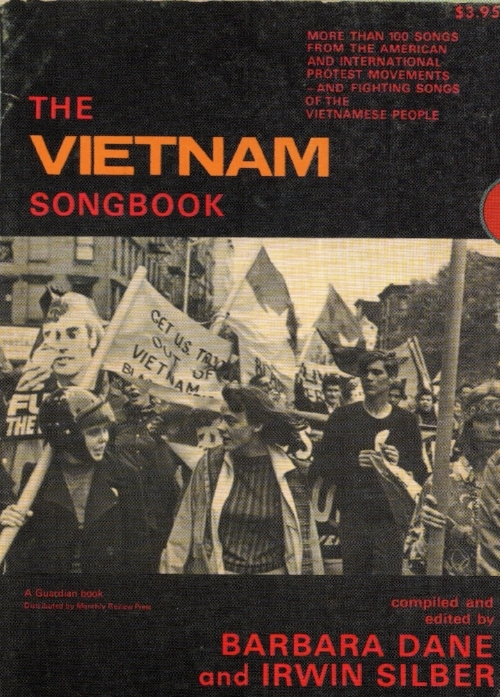 Later she and Silber published “The Vietnam Songbook,” an international collection of hot-button protest songs. She advocated and sang for active-duty GIs who opposed the war. In 1966 Dane travelled to Cuba, the first artist to defy the travel ban. With her heroic facility for causes, as broad as her facility for music, she became a literal voice of “the other America,” performing at demonstrations and peace rallies around the world. In 1974 Paredon released Avanti Popolo! Revolutionary Songs of the Italian Working Class, compiled and edited by Alessandro Portelli, his only record widely distributed in America. (Silber called it “one of my favorite records that we put out.”) Including songs performed by a Calabrian construction worker, women factory workers in Milan and Sardinian shepherds and farmers, Portelli’s collection highlighted traditional examples of Italian music that had been adapted to address contemporary political and social grievances. Drawing parallels to oral history, he wrote in the album notes that the songs “are tools for communicating ideas which can build toward unity on the left and in the whole working class, from the bottom up. All of them offer the protagonists a chance to speak for themselves.” Portelli added that his record “was intended as a communication between the working class of Italy and the working class of the U.S.A.” Included was a version of “Bella Ciao,” the signature song of Italy’s revolutionary folk movement. In the liner notes, Dane translated its lyrics into English, a reciprocal message of American support. Between her and Portelli, the international solidarity of resistance had continued into a new era. That force continues for both of them. Dane has recently supported Black Lives Matter and Portelli is once again collecting songs. In 2016 his compilation of “new migrations” to Italy—African, Bengali, Romanian, Indian and other music--was released by Nota, along with a disc of songs and stories from Kurdistan. His recordings from America will be reissued later this year in an expanded 4-CD set by Squilibri. Through their efforts (and occasionally overlapping lives) both Dane and Portelli have shown us that folk music, as it draws on the past to confront, process and record contemporary life, is also valid oral history. If you enjoyed this piece and would like to read more on the subject of oral history and music check out more of Bud Kliment's articles on the OHMA blog. Bud Kliment is a part-time OHMA student. His master’s thesis is titled “Lomaxland: Song Collecting and the Development of Oral American History.” A native of Philadelphia and a graduate of Columbia College, Bud is a Deputy Administrator of the Pulitzer Prizes, helping to organize and oversee the annual awards in journalism, books, drama, and music. He has also worked regularly as a freelance writer, specializing in music and the other performing arts. Bud has published young adult biographies of Count Basie, Billie Holiday, and Ella Fitzgerald, along with travel guides, cookbooks, and museum labels. He wrote a radio series for BBC World Service that used Motown songs to help teach English. In a younger incarnation, he ran a record store.